AC Cars was founded by London based butcher John Portwine and engineer John Weller, who first got together in 1901 to set up a workshop in south London for the purpose of manufacturing motor vehicles. In 1904 as Autocarriers & Accessories Ltd they produced the "Autocarrier" which was designed for commercial use and it proved to be very successful, being used by many well known firms as their delivery vehicles. A passenger version named the "Tricar" (also known as the "Sociable") was produced in 1909 and it was at this time that the company renamed itself Autocarriers Ltd. A move to Thames Ditton took place in 1911 with the first four-wheeled vehicle being produced in 1913. Production of this car was halted by the outbreak of the First World War and the AC factory was turned over to munitions work, with car production recommencing after the war ended. In 1921 Showrooms were opened in Regent Street in London and it was at this time that a well-known racing driver by the name of S.F. Edge joined the board of directors, and Weller and Portwine resigned. Edge became the new chairman of the company, which then became AC Cars Limited. In 1922 an AC 4 Cylinder car broke many records at the Brooklands racing circuit with speeds of over 104mph, and by the late 1920's with a range of seven models including both saloons and sports, AC was one of Britain's biggest car manufacturers. The company changed hands in 1930 due to the financial problems caused by the world depression of this time. But in the hands of its new owners, William and Charles Hurlock, AC achieved great success throughout the 1930's both in the production of cars (AC had started exporting cars to the USA), and in motor sport. The Company was once again turned over to military work during the Second world War, and production resumed at the end of hostilities with the 2 litre model which by 1950, was available in several different body styles. In 1953 AC started production of the Ace open 2-seater sports car which rapidly became very popular. By 1955 six different AC models were in production, and these included the new Aceca Coupe. In 1959 the Greyhound sports Saloon was introduced, but it was in 1962 that the now legendary Cobra was launched. It was the end product of an arrangement between AC Cars and the Texan ex-racing driver Carroll Shelby, which was to fit an American ford V8 engine into the lightweight AC Ace. This arrangement had the backing of the Ford Motor Company Itself, and the result was of course was one of the fastest and exciting sports cars ever made. More new models were launched in the 1960's and 1970's. In 1980's the Company once again changed hands and production was moved to a factory built in the grounds of Brooklands racing circuit. A further change of ownership occurred in 1993. 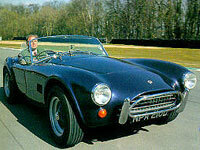 AC Cars still continues to build a full range of exciting sports cars including the Cobra. The AC Cobra was launched in 1962 and was to become one of the most legendary sports cars ever built. It was born out of an arrangement between AC who were looking for a new engine for their Ace sports car, and Carroll Shelby, who after retiring from motor racing was looking for a new business venture.